Home > Blog > Strategy > Why Are B2B Sales Cycles So Long and What Can Be Done About It? Wouldn’t it be great if every customer you talked to knew exactly what they wanted and were ready to buy it right then and there? Unfortunately, that’s a rare event for most salespeople. Instead of customers immediately signing on the dotted line, there’s a process – a series of stages – that most customers go through on the way to making a purchase. Sometimes the process is fairly quick, while other times it’s slow, sometimes even halting completely, never making it to a conversion. While you might have an occasional customer who buys immediately, as well as some that fade away during the sales process, there is a lot of insight you can glean from knowing what your typical sales cycle looks like, and how to improve it. This is especially important for B2B companies who are seeing some long sales cycles for new customers. How Long Is the Sales Cycle for B2B Companies? 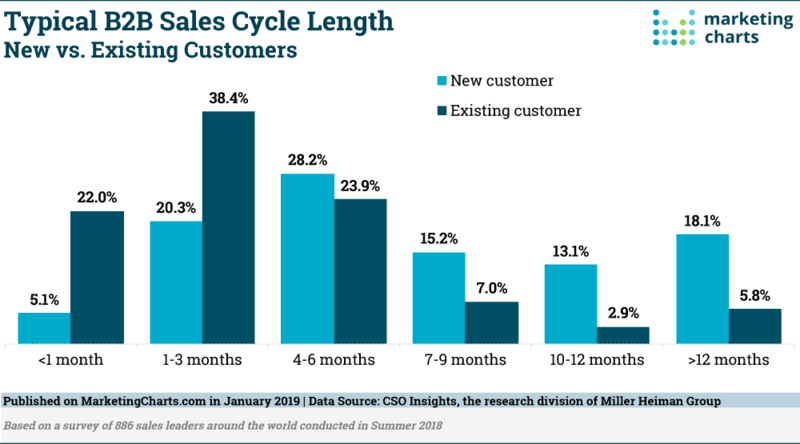 In a recent report from CSO Insights, a division of Miller Heiman Group, it shows that B2B sales cycles for new customers take at least four months to close almost three-quarters of the time, and nearly half of new customers take seven months or more to make a purchase. The cycle is considerably shorter for existing customers, showing that B2B companies should dedicate ample time to their retention efforts. But what about the sales cycles for new customers? Seven months is a long time to wait for a conversion, and the longer a potential client spends in the sales process, the more expensive the conversion ends up being to the business. On the other hand, when prospects spend shorter amounts of time in the sales funnel, the business is positioned to earn a higher profit margin from those sales. Know your benchmarks – You have to know where you’re starting to track your progress. That’s why it’s important to know what the average length of your sales cycle is for new customers. It will allow you to track your progress and measure your improvement. Additionally, it’s important that you know the industry benchmark for sales cycle length as well. If the length of your company’s average sales cycle is considerably longer than others in your industry, it might mean that your sales process needs improvement. Conversely, if your average sales cycle is shorter than your competitors’, it might indicate that your sales process is efficient and progressing as it should, or that your average sales cycle calculation is different than your competitors’. Have the right data and insights – It’s critical that you’re looking at the right data and analytics to make sense of the buyer journey. It’s only when you have the right information that you can tweak your processes to be more efficient, shortening the sales cycle by making quicker sales. Optimize the customer experience – While B2B sales cycles are much different than B2C sales cycles, there is something to be said for how B2C companies are engaging their customers. They have adapted to current times by utilizing social media, email marketing, and personalization to reach prospects and customers. B2B companies may not be able to employ exactly the same strategies, but moving in that direction can certainly have a positive effect on sales cycles. Add value at every stage of the sales funnel – The key to shortening the sales cycle is to prepare your customers to be ready to buy more efficiently. One way to do that is to provide value throughout the entire sales process. That may mean sending them informational and educational content, white papers, blog posts, etc. to increase their confidence that buying from your company will be the right decision. Streamline processes – Adding value throughout the sales process doesn’t have to be as time-consuming as it sounds, especially when you automate a portion of your outreach and content delivery. That doesn’t mean that you shouldn’t provide personalized attention to all of your prospects and customers, it means finding the right balance between the two to meet their needs and show them they are valued. Understanding your B2B sales cycle is crucial to streamlining and shortening your company’s sales processes. Not only will a shorter sales cycle for new customers increase your profit margin and save you time, but it will also help you with sales forecasting and optimizing your cash flow, two very important aspects of your business. And, it really can be done without sacrificing any of the value you provide your customers in the process.